There’s been some research showing that light at around 415 nm is effective at killing the bacteria that cause acne. This type of acne treatment is know as blue light therapy although the light in the region around 415 nm is actually violet. The British paper “Phototherapy with blue (415 nm) and red (660 nm) light in the treatment of acne vulgaris” by P. Papageorgiou, A. Katsambas, and A. Chu states in its Materials and Methods section that the blue light source they used “had an asymmetric peak of 415 nm +20/-15 nm” and an irradiance of 4.23 mW/cm^2 at 25 cm (about 10 inches). 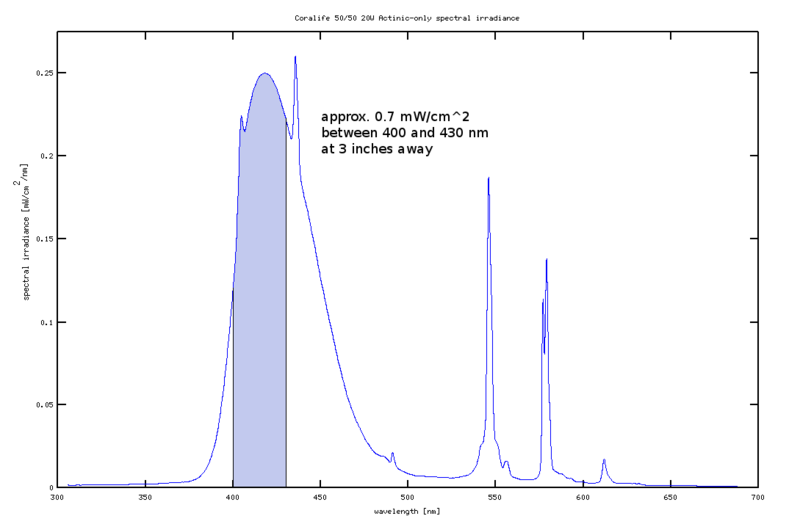 Actinic lamps produce blue light with a peak irradiance around 415 nm. I used my homemade spectrometer to capture the actinic spectrum of a Coralife 50/50 20W compact fluorescent. In the range of wavelengths from 400 to 430 nm I measured a total irradiance of approximately 0.7 mW/cm^2 at 3 inches (7.65 cm). Therefore the Coralife actinic lamp has only a sixth of the strength of the lamp used in the British paper. However, the experiment used an irradiance time of 15 minutes such that the patient was exposed to a “cumulative dose of 320 J/cm^2”. Since the Coralife actinic lamp is a sixth power of the experimenter’s lamp, then multiplying the exposure time by six should result in the same dosage. Therefore one could hypothesize that an exposure time of 90 minutes with a Coralife 20W lamp will produce similar results to those seen in the paper. I haven’t tested this hypothesis because 3 inches is quite a small distance and having the lamp that close would prevent me from doing anything else during the therapy session. The lamp would obstruct my field of view and the blue light is an eye hazard. Given that it would take 90 minutes to receive a full dose and that a portion of the light output is in the UV wavelengths makes blue light therapy by means of a Coralife bulb even less attractive. However, it might be possible to spread the exposure time over multiple sessions and use those sessions to rest or listen to music. If anyone tries this out please leave a comment.